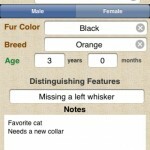 The Cat Manager & Age Calculator is designed for cat lovers and feline enthusiasts to track their pets. 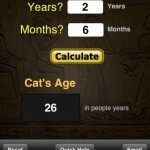 Also, you can calculate the comparable age of a cat to a human age. 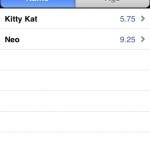 The formula used is fifteen cat years for the first year, nine more cat years for the second year, and 4 years of cat aging per human year after that. The Dog Soundboard makes a barking, whining, and growling noise for four different types of dogs: Chihuahua, German Shepherd, Labrador, & Rottweiler. 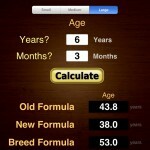 The database in the app is also good tool to track your canines age, breed, and just generally take notes on each animal. 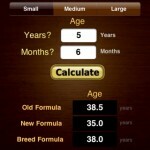 The Dog Age Calculator is designed to calculate the comparable human age of a dog using three different formulas, the old formula (7 dog years for every one human year), the new formula (10.5 dog years up to 2 years and then 4 dog years per human each year after), and the breed formula (up to 24 dog years for small and medium breeds and 19 dog years for large breeds up to 2 human years, then 4 for small, 6 for medium, and 8 for large breeds each year thereafter).